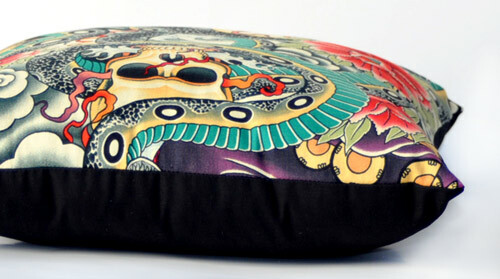 Inspired by traditional Japanese art and tattoo design (irezumi), the fabric used to make these pillows is called “Zen Charmer” from Alexander Henry Fabrics. It features a highly detailed and colorful design of geisha girls playing the shamisen (guitar), skulls and entwining serpents, flowers, clouds and waves. The pillows that make up this set measure 14″ x 14″ and are stuffed with polyester fiberfill; not too firm or too soft. Both sides made with 100% cotton fabric.